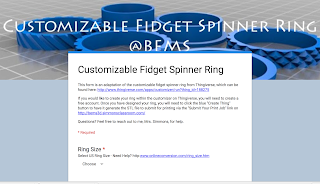 I have had a number of students asking me how they could create a fidget spinner ring on our 3D printers. Wanting to find an option that did not require creating an account, I made a Google Form for a trial run to see how well it would work as an alternative. This form is an adaptation of the customizable fidget spinner ring from Thingiverse. Questions? Feel free to reach out to me, Mrs. Simmons, for help. If you'd like to find this form later, I have it linked under the "How to Design" button above.